← Going Through a Break Up? Then Break! People are finding in their relationships, and search for Love some of the most ignorant people that could ever exist. I am sorry, but I’ve got to tell it on this one. Ignorance is a choice. The days of “I don’t know” are gone. The definition of ignorance is to be unlearned; without knowledge and information. There is no excuse today to be blatantly ignorant in not taking responsibility of self awareness in order to prevent destruction in a relationship. Playing Russian roulette with Love provides nothing but a cycle of emotional and mental suicide. We live in a time where information is literally right at our fingertips. We have self help tools within our reach via laptops, ipads, phones and books. So when folk don’t know they in turn, choose stupidity. 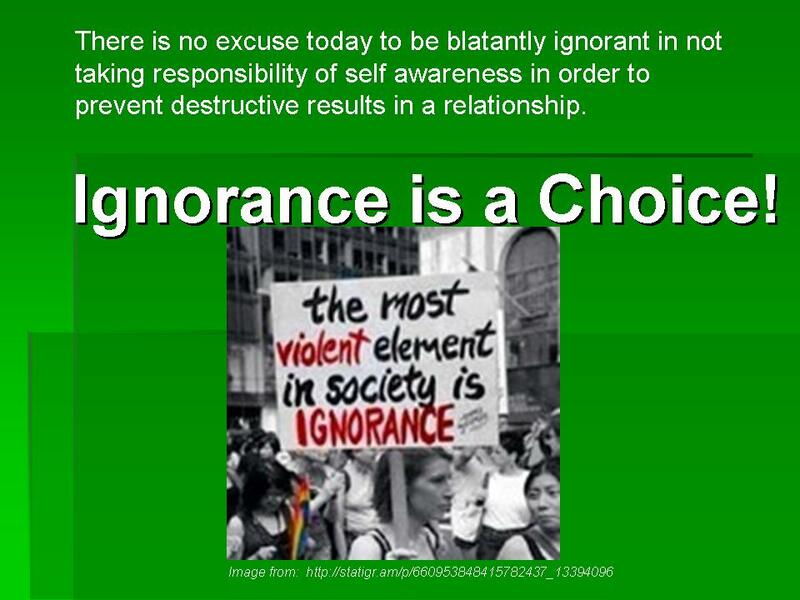 How stupid to make the choice of ignorance! According to Steve Siebold, Author of “177 Mental Toughness Secrets of the World Class,” only 10 percent of the population actually invests in self help improvement tools, seminars, and books. This is a disturbing statistic, especially with all of the information we have access to. You think this statistic does not impact your experience in search of a solid relationship or worse, in your relationship? Yes, it does. There is a chance that 90% of the people you meet are not on the path of self improvement. The lack of self improvement carries many negative repercussions. It is necessary and in the best interest of everyone that we all be informed to not only choose to make sensible relational decisions, but to also be knowledgeable enough to disallow negative individual characteristics and behaviors to destroy relationships. Lack of self improvement results in the lack of self awareness; and the lack of self awareness prohibits one’s ability to see self. Being unable to see self carries a combination of pride, selfishness, dishonesty, insolence, stubbornness, insecurity, and self righteousness. These problems land dead smack in the middle of the relationship. It is very difficult relating to a stubborn partner, who cannot see how being resistant and hard to reach in a simple conversation takes a toll on the relationship. Fighting to be heard and fighting to be understood is extremely frustrating. Anyone who cannot see through their self righteousness, and will not admit when wrong, will turn any peaceful talk into an argument. When this happens one too many times, a break down in communication occurs. One of the worst reactions in a relationship is silence by anger and frustration. This is what happens when the communication is broken. Insecurity is not only a burden, but a high maintenance, clingy, and needy emotion that puts wear and tear on both partners. Someone who is insecure has a never ending need to be seen, felt, recognized, coddled, and pacified. Limiting oneself with dishonesty, builds the barricade of accepting the truth, much less telling the truth. Emotionally needy and deficient people mostly always hook up with a more stable personality type. The selfish hooks up with the generous. The insecure latches on to the more secured personality. The stubborn? Rarely hooks up with another person just as intolerable. Dishonesty mostly always make honesty a victim in one way or another. It is seldom that the stubborn, proud, self-righteous, dishonest, and selfish partner tries to remake or reshape his/her destructive ways, by following the stronger example of their partner. The ill-intentioned who is bent on ignorance does not deserve love from the well-intentioned. Not only is a relationship about love and being together. It is also about improvement and growth by learning from the strengths of each other. Ignorance in a relationship ends in emotional suffering. Rather than shaping the relationship into a happy union, both partners are continually faced with drama, fighting, lying, frustration, and anger. When the relationship ends, and it will, the blow from the pain will either be a great teacher of experience or a debilitating one, with the residue of fear of what can possibly happen when entering another relationship. There is a price to pay for ignorance! Learn to identify and self protect against the ignorance! It is important to identify the false positives of someone who is reckless about Love. How does it feel being in this person’s presence? Does it feel comfortable? Is there doubt, a gut feeling, or a gentle probing of instincts that something is wrong? Without forcing anything, does being with this person feel natural? How good are they with their word? Do they show up and then drop off? Do they create doubt? Does it feel as though they are hiding something? Learn to identify the problems before getting into the deep with the person who has such issues. Ignoring the problematic signs upfront guarantees a lifetime of problems. We must become well acquainted with our partner, and the one we are considering to be a part of our lives and our hearts. This is done through lots of conversing, listening, and observing behaviors in order to know and understand the person who we are giving our time and hearts to. Have open dialogue with that person. Listen to what is being said and be able to rationalize it. Is he/she a thinker? You want an authentic partner, not an android. Is experience speaking? Listen! Ask questions! Be interested! Observe how this person interacts with you and others. How vast or limited is his/her knowledge base? Are the words being spoken genuine, or are you being told only what you want to hear? Failing to do these things will show problems later as the relationship moves forward. Being free from fears of failure, past loves, doubts about loneliness, and not finding someone to love, is important in order to have a clear and objective mind. We miss important clues and signs when our minds are clouded and our hearts are fearful. Ignorance is only removed when we seek to study truth and fact. Don’t always go with what you’ve heard, but seek out what you’ve heard. Engage in self improvement and always invest in the betterment of self. Saying you want truth, but being resistant to the truth, makes you an ignorant destroyer still. Let’s put an end to the destruction of ignorance in relationships. This entry was posted in Destroy and tagged ignorance is ruining a relationship, no growth in a relationship, partner will not grow, stupid people in relationships, when a partner is stupid. Bookmark the permalink. 4 Responses to End the Ignorance in Relationships! Nailed it! A perfect introduction into such a deep topic. This should be taught in our schools. I do know > idk. Thanks Chris! I wish you relational happiness! You just gave me a better understanding as to why my past relationship did not work, and I was heartbroken to say the least. We blamed each other, but from reading this and from having found self awareness and have taken responsibility for my destructive ways, I see that we both were being destructive. I was stubborn and insecure and he was prideful and selfish, it was never going to work. Two years later and in the present moment, I am in a relationship with a man like the one you have described. He’s a thinker, a listener; he asks a lot of questions, he is genuine, logical, and knowledgeable. I have fallen in love with him and we both want to grow as individuals, but do it together. I am the person who is trying to reshape her destructive ways, by paying attention to how he moves in certain situations. I am unlearning to learn new ways. Thank you for your post. Wow! Celeste G. A dream come true! I am thrilled for your true love!